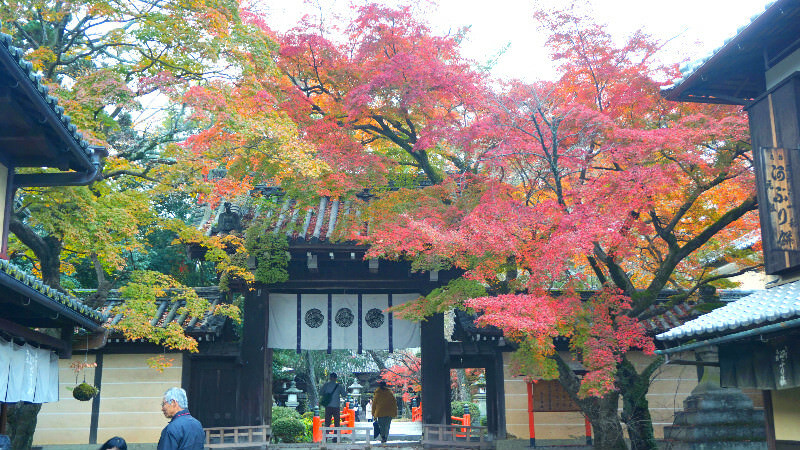 Autumn leaves season in Kyoto is beautiful but the most popular spots are also really crowded, and this is where Sharing Kyoto can help you! 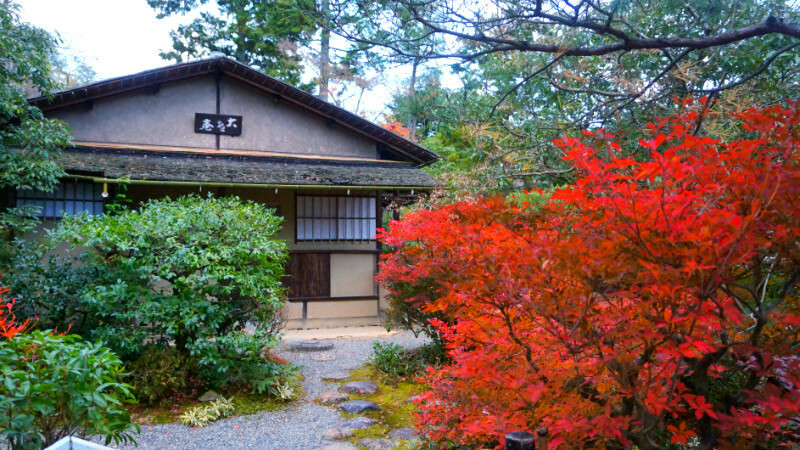 When you hear the word Kyoto, many of us think of shrines, temples, and of the autumn leaves. This is the standard Kyoto sightseeing course. But the problem with really famous sightseeing spots during the peak time is that there are too many people so you can’t relax. But wait! 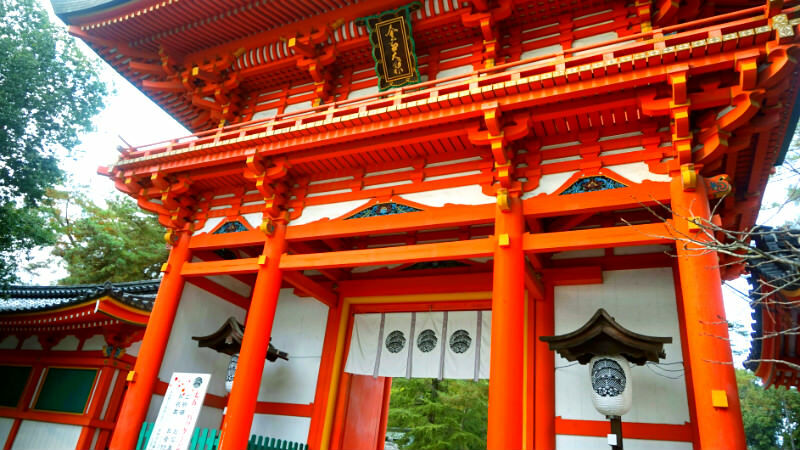 There are almost 3000 temples and shrines in Kyoto city! Since there are so many of them, there have to be some places where you can relax and take in the scenes leisurely. 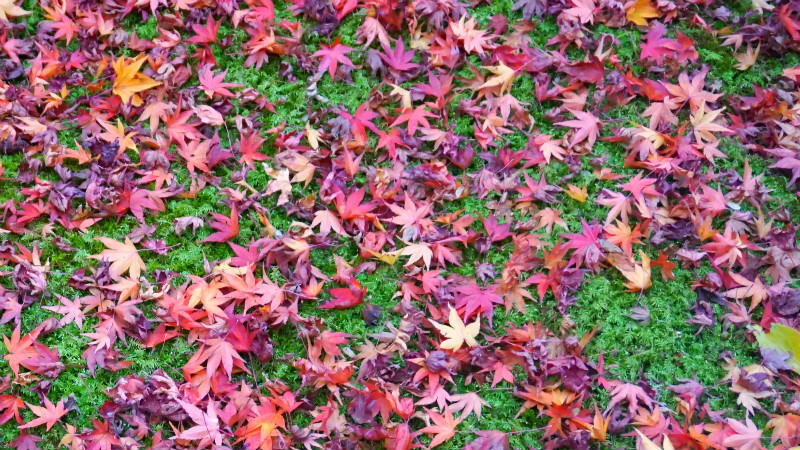 Armed with this information, it is time for me to introduce to you my “Expert’s way of enjoying autumn leaves in Kyoto” guide! I also visited these places a bit after the peak season had passed. 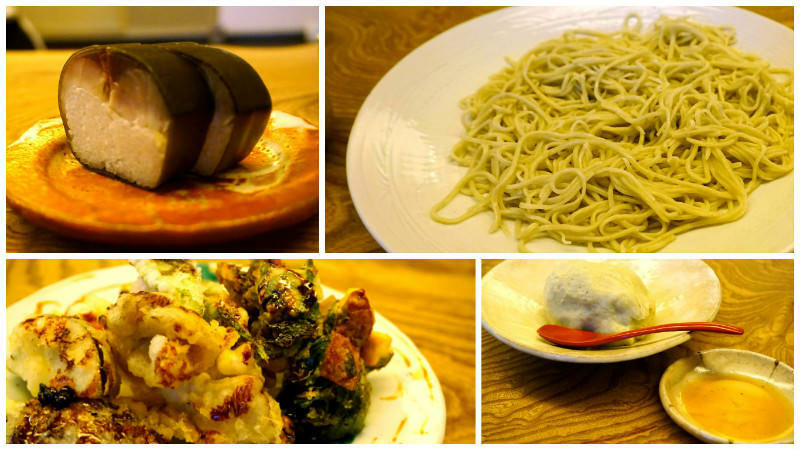 If you read this article to the end, you will find some “delicious” information! First I visited Imamiya Shrine! My expert’s guide is going to have three points on how to enjoy Imamiya Shrine. 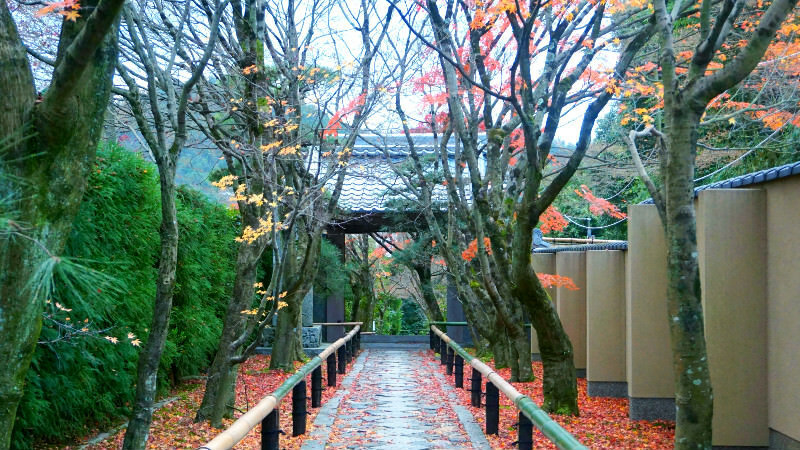 Expert’s Tip Number 1: At the temple gates the ground is covered with fallen gingko tree leaves! 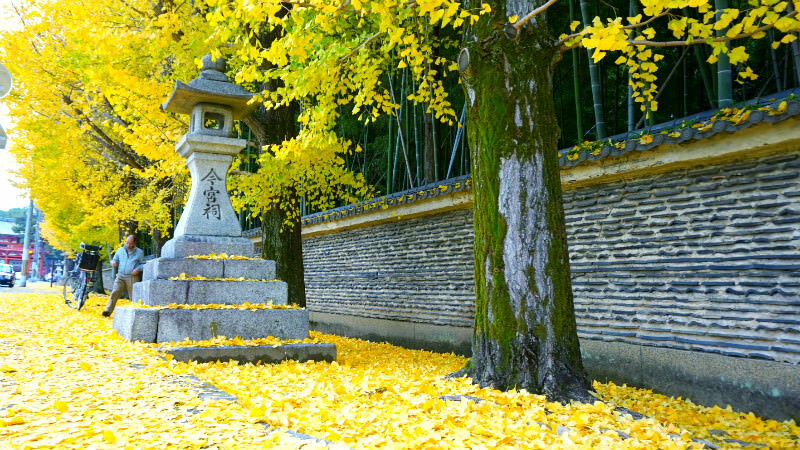 In front of the shrine gates there is a row of gingko trees covered with vivid yellow leaves. This “gingko carpet” made out of the fallen leaves can only be seen in autumn. The sidewalk covered with leaves was a highlight of my visit. Now we are inside Imamiya Shrine. There are only a handful of people and the feeling is serene. 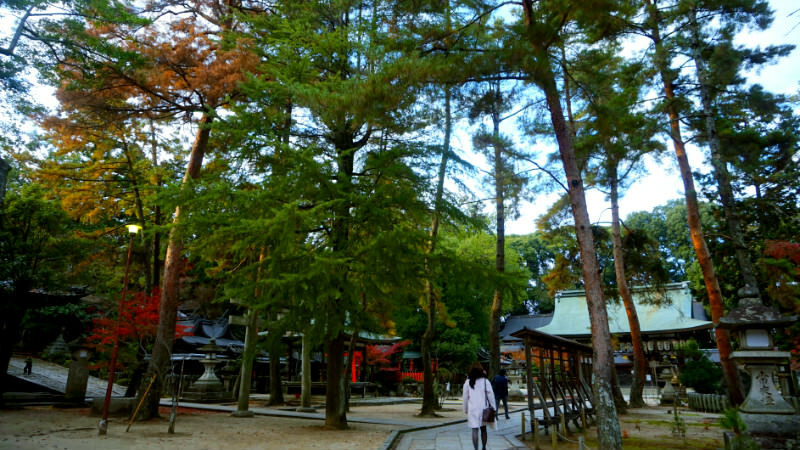 The trees shooting up to the sky and the quiet shrine… it all felt somewhat mysterious. The maple tree leaves had not fallen yet. 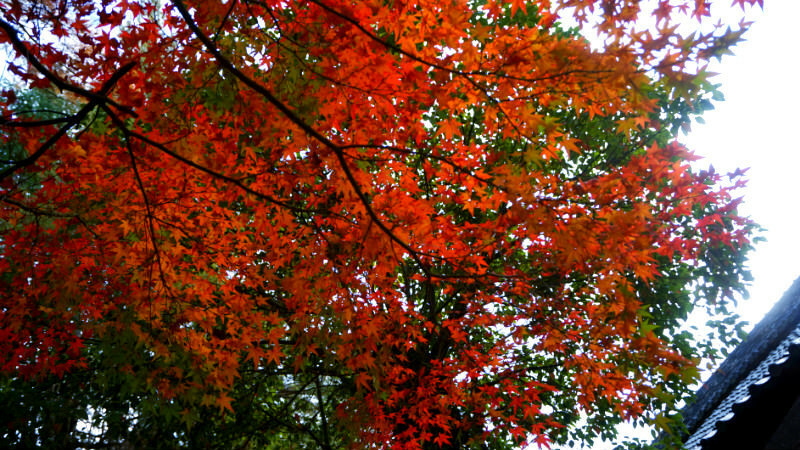 The scarlet red maple leaves covering the sky are a beautiful sight no matter where you see them. The autumn leaves can be seen this leisurely only because it is not peak season. If you go to a shrine, please also pay a visit to the altar! We from Sharing Kyoto prayed for good health and longevity. 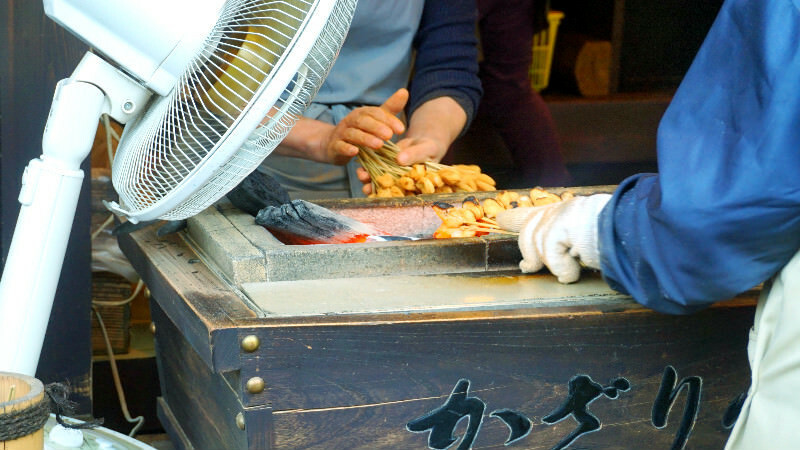 Expert’s Tip Number 3: Imamiya Shrine’s famous grilled mochi! If you come to Imamiya Shrine, you have to try some grilled mochi that are sold close to the temple. Of course we from Sharing Kyoto also had some grilled mochi! After entering the shrine, on your right side there is a bridge that takes you away from the temple premises. After crossing the bridge you come to a huge gate with noren fabric dividers. After you go through this gate you get to the grilled mochi shop. Oh, I can smell something nice… I, Shiho, have a weakness for sweet stuff and am already tracking the scent to the mochi shop. I want to eat grilled mochi soon! After going through the gate there are maple trees too, which together with the townscape make for a refined view. On the south side of the small street there is the famous shop we visited this time, Kazariya. It has already been 400 years since Kazariya was founded! 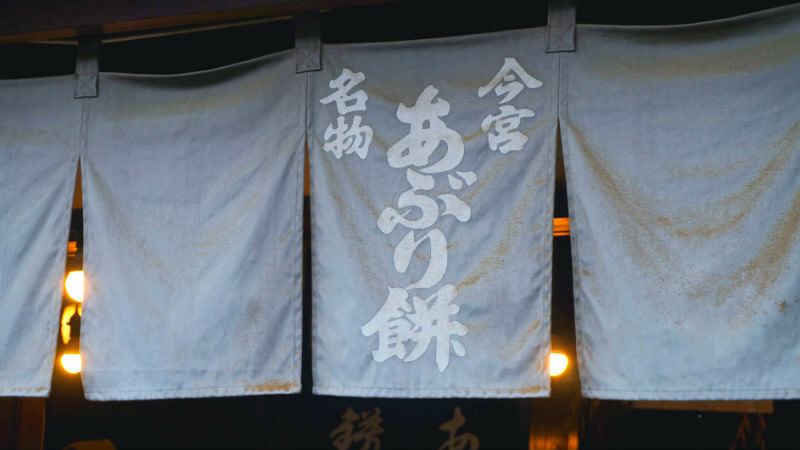 It is said the shop started out by offering bamboo skewers and mochi used at Imamiya Shrine rituals to the worshippers to ward off evil. It is a shop with a deep history. They were grilling mochi in front of the shop when we got there. 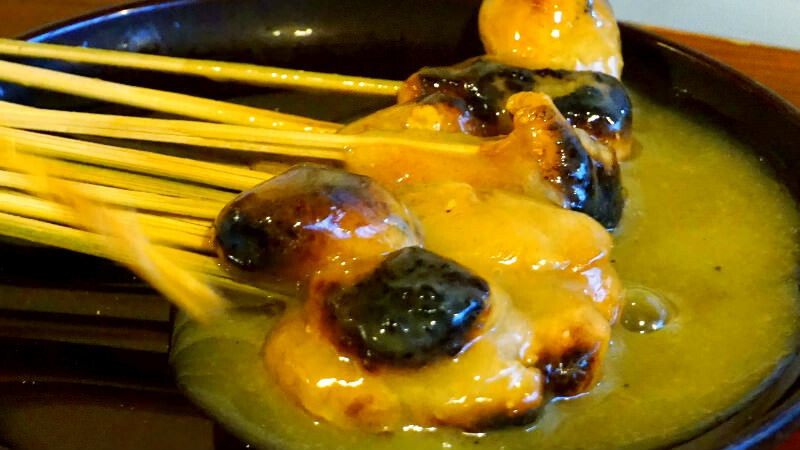 The grilled mochi are covered with kinako roasted soy flour and grilled on charcoal and after this sweet white miso sauce is poured over them. You can smell the fragrant scent of the charcoal in the air. It looks so yummy… finally it is time to taste the mochi! The price for one portion of grilled mochi starts at 500 yen. The white miso sauce covering the kinako mochi is sweet and the mochi are soft and sticky, delicious! You can also eat the mochi outside, but you should take this chance and enjoy the time-honored taste of the mochi inside the restaurant with some tea! Next I am going to introduce a temple in the Takagamine area of Kyoto, Koetsu-ji Temple. The temple is built on the place where Hon’amikoetsu Yukari, an artist who lived during the beginning of the Edo period, used to live. 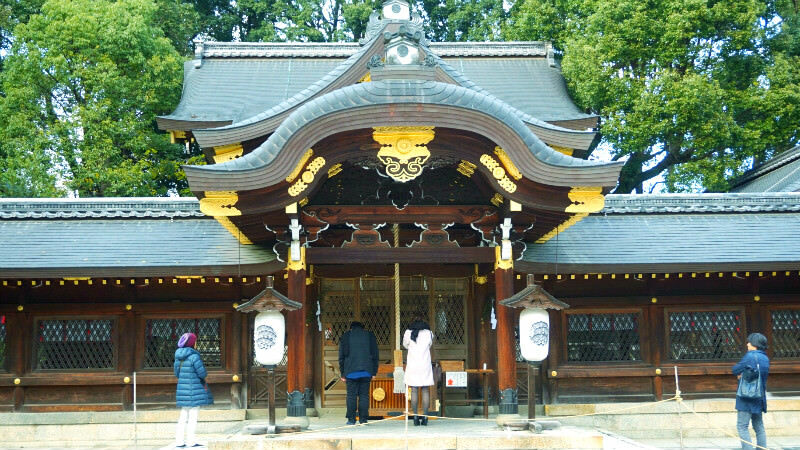 This temple is famous for having seven tea-ceremony rooms. There are few tourists and the serene atmosphere of the temple makes this a great place off the beaten track. Personally I love the autumn leaves at Koetsu-ji so this place is one of my favorites. It is a bit far from the center of Kyoto but I guarantee it is worth a visit! One way of enjoying autumn leaves is looking at the scattered leaves on the ground. The autumn leaves are really beautiful when they are still on the trees, but even after they fall and scatter they are still beautiful in an ephemeral way. This is one of the seven tea-ceremony rooms, Daikyo’an. It is said Hon’amikoetsu was absorbed in rice bowl making in this room. Just thinking about a famous Japanese artist having lived here, making artwork, makes me shiver with emotion! 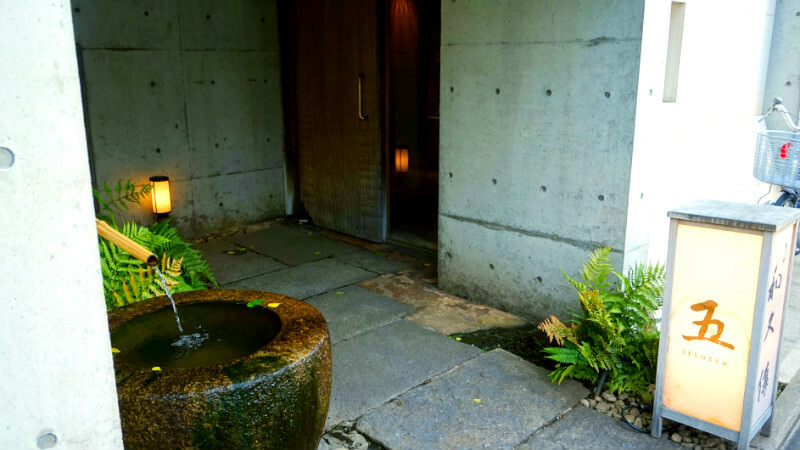 You can’t go inside the tea-ceremony room, but there is a bench in front of it. Please sit on the bench and enjoy the view of the Takagamine area. You will feel refreshed from looking at the beautiful foliage, but can also feel the history of the place in the air, and think about Hon’amikoetsu and other great people who have gazed at the same sight. So how do you feel about Koetsu-ji Temple at Takagamine? It is a different experience to the temples that have night illuminations, but it is a lovely serene autumn leaves experience. If the most famous temples are not enough for you, then how about going off the beaten path and looking for a new Kyoto at Koetsu-ji Temple. Bonus: How About Some Delicious Soba Noodles? After a movingly beautiful autumn leaves viewing, if I could have some good food, I would have nothing to complain about. That is why I am going to introduce a restaurant just like that to you. This time I went to Itsusu, a soba noodles restaurant close to Daitoku-ji Temple. Itsutsu is on the second floor of the famous kaiseki restaurant Murasakino Wakuden, and is in fact also operated by the kaiseki restaurant Wakuden. Itsutsu opened in 2016, and as a soba noodles restaurant run by the famous Japanese restaurant Wakuden is worth a visit. At Itsutsu you can drink sake. They only carry good sake so I hesitated a bit on what to order, but in the end I got some sake from Nara prefecture called “Kaze no Mori”, the Forest of the Wind. 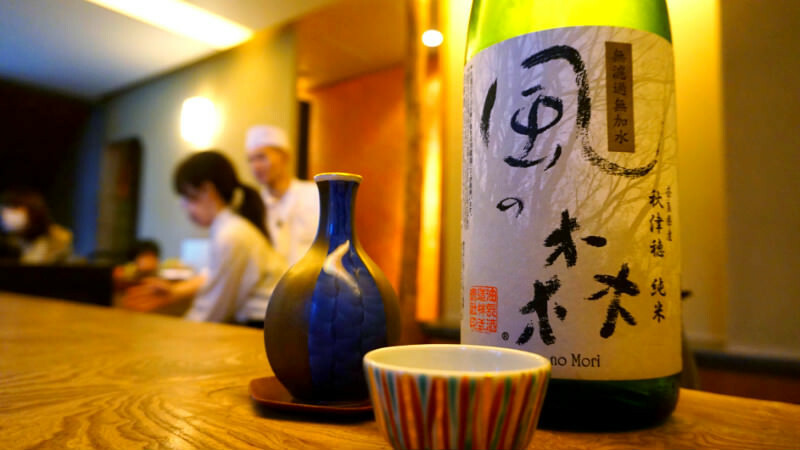 This sake tastes refreshing and mild, and goes well with all kinds of dishes. Personally I really like this refreshing sake that has a bit of fizz. During lunchtime at Itsutsu you can have mackerel sushi or tempura with your soba noodles for a reasonable price. This makes for a splendid lunch! During my trip I realized that Kyoto is not only Kiyomizu Temple and Eikan-do Temple, but there are other equally attractive autumn foliage spots too. If you move your trip just a little bit after the peak time (I chose the last week of November), there won’t be too many people either. 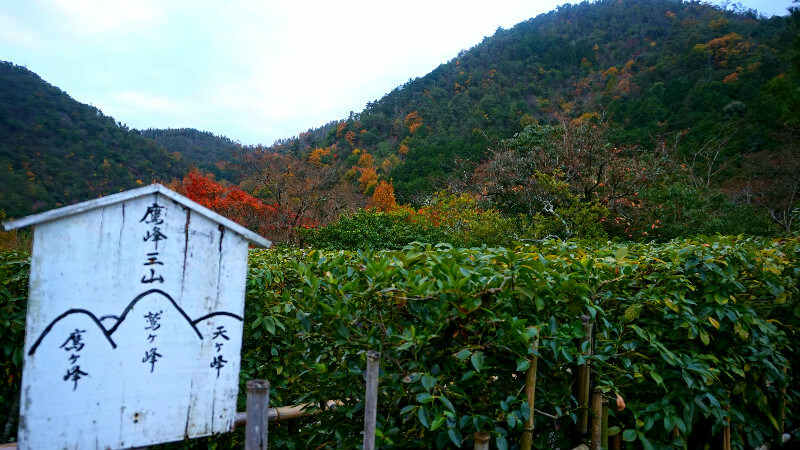 Please come to Kyoto and find your very own autumn leaves spot! We introduced autumn leaves viewing spots and also to a soba restaurant, but my favorite has to be Koetsuji Temple and the fallen autumn leaves! It is a quiet charming place, and there are not a lot of people so you can enjoy the autumn leaves at your leisure. I hope you will visit Koetsu-ji Temple in November when autumn is about to end!